FOXBOROUGH, Mass. – Sunday’s match between the Revolution and Fire is sure to be an intriguing one based on the history shared between the longtime rivals. 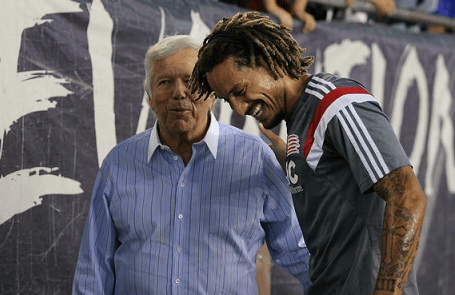 Oh, and also the whole Jermaine Jones saga that unfolded two weeks ago. Another element that seemed to sharpen the stakes for Sunday was that, on paper, it would be the first time that Jones would play against a squad from Chicago, the city listed as U.S. International’s hometown on ussoccer.com. But following Wednesday’s match, Jones set the record straight about his alleged ties to the Windy City. It is not uncommon for U.S. Soccer to list an American city as a hometown for a foreign-born product. Former U.S. midfielder Thomas Dooley, who was also born in Germany, once had Mission Viejo, California listed as his hometown. Despite the confusion, the tug-of-war for Jones’ services is sure to serve as a subplot for Sunday’s match. According to reports, the Fire brass spent considerable time and effort to recruit Jones, who was looking to make a move to MLS after his contract with Besiktas expired earlier this year. But after the Revolution notified the league office that they, too, were willing to make a bid for the U.S. International, a blind draw was held, and Jones was awarded to the local XI. While Jones said his focus will be on the task at hand on Sunday, he did admit that it won’t be just another match. This is a great little article considering all the stuff that’s been out there recently. I wish there were more quotes or elaboration here. Where does he say he’s from, for example? This report also implicitly confirms the “Chicago was trying to get Jones, then the Revs swooped in” narrative – “Fire brass spent considerable time and effort…”, “But after the Revolution notified the league office that they, too, were willing to make a bid…” – which I had understood the Revs FO to have adamantly denied, insisting that they’d been after Jones for a while before anything was made public. Wonder which is true?